Although Lean and Six Sigma appear to be quite different, when used together they have shown to deliver unprecedented improvements to quality and profitability. 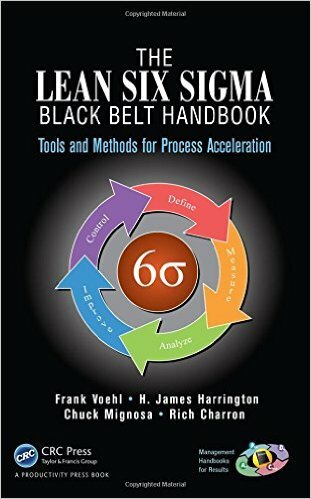 The Lean Six Sigma Black Belt Handbook: Tools and Methods for Process Acceleration explains how to integrate these seemingly dissimilar approaches to increase production speed while decreasing variations and costs in your organization. Presenting problem-solving tools you can use to immediately determine the sources of the problems in your organization, the book is based on a recent survey that analyzed Six Sigma tools to determine which are the most beneficial. Although it focuses on the most commonly used tools, it also includes coverage of those used a minimum of two times on every five Six Sigma projects. Filled with diagrams of the tools you’ll need, the book supplies a comprehensive framework to help you for organize and process the vast amount of information currently available about Lean, quality management, and continuous improvement process applications. It begins with an overview of Six Sigma, followed by little-known tips for using Lean Six Sigma (LSS) effectively. It examines the LSS quality system, its supporting organization, and the different roles involved. Identifying the theories required to support a contemporary Lean system, the book describes the new skills and technologies that you need to master to be certified at the Lean Six Sigma Black Belt (LSSBB) level. It also covers the advanced non-statistical and statistical tools that are new to the LSSBB body of knowledge. Presenting time-tested insights of a distinguished group of authors, the book provides the understanding required to select the solutions that best fit your organization's aim and culture. It also includes exercises, worksheets, and templates you can easily customize to create your own handbook for continuous process improvement.